Lyme disease is a tick-borne illness with a peak incidence in the eastern United States during the summer months of June, July and August. The late manifestations, such as arthritis, can appear at any time during the year. It is most common in the northeast and mid-Atlantic states (from Maine to Virginia), the Midwest (Minnesota, Wisconsin and Michigan) and on the west coast in northern California. The ticks are carried by mice and deer and are more likely to infect when they are quite small (the size of a poppy seed.) When the ticks change and become larger they are less likely to transmit infection. Ticks are most commonly found on the underside of low-lying shrubs or grass, particularly between grass and forest. They are not common on well-cut lawns, such as a golf course. A tick can attach to a pet and then attach to a human, thereby transmitting the disease. If the tick is removed before it becomes large (engorged with blood) it is very unlikely to transmit Lyme disease. If a tick is on the skin, but does not bite it cannot transmit disease. If a tick is removed within 48 hours the risk of transmission is quite small. The risk of transmission in one study where a tick was removed before it was engorged in an area where 15% of ticks carried Lyme disease was only 1%. The best way to remove a tick is with tweezers or your fingers covered with some protection, such as a disposable rubber glove. It is important not to crush the tick. After removing the tick wash the area and your hands with soap and water. 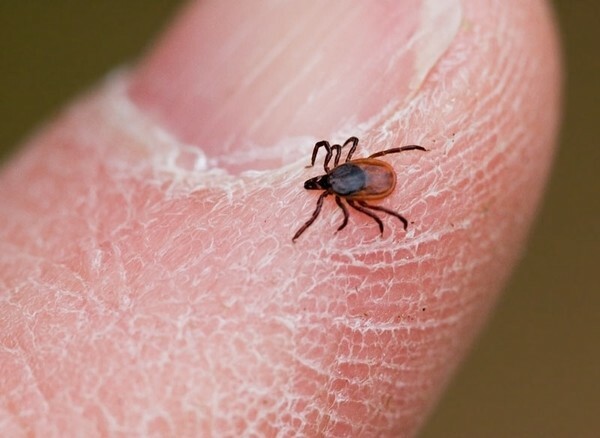 If a person cannot take doxycycline then no antibiotic should be prescribed as prophylaxis against developing Lyme disease after a suspicious tick bite. Doxycycline is usually given as a single 200 mg dose. The time between a tick bite and the onset of Lyme disease symptoms is 2 to 3 weeks. The first manifestation is usually a rash. Lyme disease also can cause arthritis, neurological problems, heart conduction abnormalities and other problems. Unfortunately, it takes two weeks for antibodies to appear in the blood making a blood test for Lyme at the time of the tick bite useless.